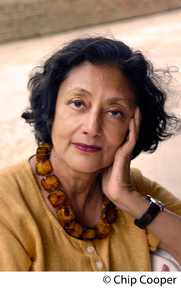 Bharati Mukherjee, a professor of English at the University of California, Berkeley, is the award-winning author of numerous works of fiction and non-fiction. Her latest novel, Miss New India, was recently published by Houghton Mifflin Harcourt. Miss New India bears a resemblance to a long line of other works where a young person from a rural area goes into the big city in search of things new and different: how do you see this work fitting in with similarly themed works set in different times and places, and how is Anjali’s experience different? The story of Anjali's belief in her inalienable right to personal happiness and her pursuit of that right, which propels her from her hometown to a far-off, thriving, expanding metropolis is my story as well as that of Anjali, of Thackeray's Becky Sharp and of Dreiser's Sister Carrie. We're currently witnessing contemporary American versions of that drama as hundreds of thousands of documented and undocumented migrants, yearning a better life, cross our porous borders. That yearning is universal. But Anjali's specific response is shaped by her psychological make-up, her cultural upbringing, and the where and the when of her journey of self-discovery. In Miss New India I braided Anjali's coming-of-age story with the drama of India's immense self-transformation over the last fifty years. Where: If Anjali had been raised in a cosmopolitan mega-city, such as Mumbai, she would not have had to migrate in search of jobs. If she had been born in a remote village, she would probably not have had the untested sense of self-worth necessary for breaking with age-old tradition; certainly she would not have had the English-language fluency required of "call-center" employees. At the start of the novel, Anjali is an urban teenager with urban ambitions, stuck—she fears—in Gauripur, a provincial town with a stagnant economy and limited opportunity (other than "arranged marriage") for a young woman with middling education born into a patriarchal family of modest means. Her impatience with the shabby future that Gauripur can offer her, propels her to seek better quality of life elsewhere. When: Anjali's personal quest for self-fulfillment coincides with economic boom-time in today's India. The global corporate practice of "outsourcing" has transformed Bangalore, which was a "cantonment town" during the British Raj, into an ever-expanding, overcrowded IT-"hub city" with a population of 8.4 million. "Call-centers" attract young women and men, often from provincial towns with sluggish economy, to work the phones as "customer service agents." The pay is good, and most of the young employees are out of the censorious reach of their traditional families for the first time in their lives. They feel empowered by their financial independence, and are not at all afraid to improvise rules to live happily by. Globalized economy has brought seismic changes to Indian society. Anjali's quest would not have been feasible if she had been born a generation earlier. Personality: Though Anjali and her older sister, Sonali, were brought up in the same strictly traditional family, they respond very differently to their desires for a better, happier life. Sonali stifles her dreams, and after a brief protest, submits to an "arranged marriage" to the bridegroom her father has selected. Though this marriage ends in heartbeak, divorce and single motherhood, she values tradition. Anjali gives her father a chance to find her a "suitable" bridegroom, but when her father fails again, she has the guts to take control of her own future, undeterred by the pain and disgrace she knows her middle-of-the-night flight from home will cause her parents. A significant feature of my mapping the arc of Anjali's narrative is that I'm writing of a "new India" that is still evolving by the minute. I'm not writing about a fixed moment in history. The joint-story of India and Anjali isn't over. That's what excites me as a novelist. The Indian call centers as described seem like fascinating places. Did you visit many in doing the research for this book, and how did you feel about what you saw there? Yes, I made many trips to Bangalore. The trips started out as family visits to a favorite first cousin who has settled in Bangalore's Dollar Colony after retiring from a life-long career with a Europe-based international agency. We lived together in a joint-family household in Kolkata when we were children. Over the last seven years or so, I was astounded—mesmerized—by the rapid sprawl of Bangalore, the sprouting of futuristic corporate "campuses," the surge in the numbers of confident, sharply dressed workers in IT industries, the erection of luxury hi-rises, gated communities, shiny shopping malls, Five-Star hotels, clubs, and restaurants. My family visits turned into research "field trips" for Miss New India. I had many "resource persons" associated with different aspects of the IT-industry in Bangalore. They arranged visits to campuses and training centers for "accent-neutralization" and "accent-enhancement", to team-building wilderness-camps. I interviewed scores of "customer service agents," and hung out with them in popular bars and clubs. Their Bangalore radiates energy, swagger, money, and consumerist glee. Like Dorothy in The Wizard of Oz, I wasn’t in the India of my girlhood. Several reviewers criticize Anjali's passivity in the face of what's going on around her; do you see her as passive and reactive, and if not, why do you think she's coming across this way to some readers? Perhaps these readers are looking for a cartoon superwoman, who has magic tools for instant overcoming of problems. I'm aiming for a psychologically credible, empathic portrayal of a restless, impetuous teenager who has grown up in a tradition-steeped family in a dead-end, provincial town, and who flees home and hometown when the bridegroom her father has selected for her violates her on their first date. Anjali arrives in Bangalore, a traumatized, naïve woman. She has to make her way in an unfamiliar go-go city, where ambition, greed, and corruption reign. She is prey to conflicting emotions, and she has no role models to mentor her. Anjali, Bangalore, India: all are in flux. In her first hour in Bangalore, she thinks of herself as a twig swept out in a flood. I hope a careful reader will recognize the steps in her awakening and self-empowerment. Let me just draw attention to three of them: A flash "awakening" occurs when she strays into the forbidden rooms of Bagehot House, and discovers the faded photograph of British colonial officers brutalizing the corpses of Indian freedom-fighters. Born long after India's Independence, the history of nationalist uprising had had little urgency for her. That photograph, preserved by Minnie Bagehot, her Anglo-Indian landlady, galvanizes her sense of national identity; brings her new understanding of her parents' loyalty to Indian traditions; and quickens her hate for Minnie, and for the British Raj that Minnie has chosen to still embody. Another phase in her evolution is dramatized in the scene when she and her wealthy, well-connected suitor, Mr. GG, survey the ruins of Bagehot House and the turning of soil for the erection of new luxury buildings by profit-hungry real estate developers. Mr. GG begs Anjali to accompany him, on whatever terms she chooses, on his business trips abroad. But she rejects that easy escape. "My new beginning is here," she tells herself. She sends Mr. GG away. I think of hockey-stick-wielding Anjali confronting the goons who have broken into the Banerjee house and grievously injuring one of them as her "redemptive" and physically self-assertive moment. By the end of the novel, she understands what Rabi Chatterjee, her young photographer-friend, means when he talks about "light and angles." She can now see her life, her hometown, her dead father, her inconsolable, widowed mother, and her self-sacrificing sister in different light and with greater clarity. Which part of this book came to you first? The character of Anjali, and her "flowering" in the context of the social, cultural and economic changes inevitable in our era of globalization. Which character was the hardest to write? Which one was the easiest? Are any of your characters based on people you know or purely imaginative? All my characters are purely imagined. I did extensive research before starting the novel in order to feel confident about the circumstances of my characters' lives and the range of their hopes and fears. Once I had a solid "feel" for Anjali, the characters who interact with her in the three phases of her self-evolution—Gauripur, Bagehot House, Dollar Colony—fell organically into place. How do you see the "new India" continuing to evolve in the coming years? I see both "the collateral gain" and "the collateral damage" of the current rampant economic growth. Young women like Anjali are the psychological and material beneficiaries of the economic boom. The victims of the land-grab by corporate entities and greedy developers, who want to turn rural acreage and crumbling historic architecture into glass-and-steel self-sufficient complexes, are the uneducated village youths and the aged proprietors of under-performing parcels of land, such as the Bagehot House. The infrastructure of the city—the maintenance of roads and public transportation, electricity, water—is inadequate for the tremendous growth in population. I hope that confrontation between the "haves" and the "have-nots" can be headed off with better city planning. There have already been some ugly street confrontations between groups of reactionary rural youths and the newly empowered, progressive women who work at "call centers." Are there particular lines or scenes in the book of which you are especially fond? I'll pick three scenes: the scene in which Anjali is dressed in a heavy silk sari and being photographed for her bridal-candidate photo in Sengupta's Marriage Portrait Studio, by Shaky Sengupta and his new assistant, American-born Rabi Chatterjee; the brief scene in Bagehot House when Anjali transgresses one of the Bagehot House rules, by prowling in dusty rooms closed to Bagehot House boarders, and discovers the brutal face of the British Raj in the graphic photograph of grinning British officers desecrating bodies of Indian freedom-fighters; and the penultimate scene of the novel, set in a nature preserve. Anjali canoes with her two gay friends, Rabi and Moni, to an island in the Kavery River, and watches crocodiles sunning themselves. She feels totally at peace. "Nothing bad can come out of this," she thinks. "How to explain the wonders of the world." What authors or books did you love as a child? I was a precocious reader, and read indiscriminately. I remember with fondness devouring Russian novels in Bengali translation as a child. As a teenager I loved reading Thackeray, Galsworthy, the Bronte sisters, George Eliot, and reciting soliloquies from Shakespeare's tragedies. But what I enjoyed most were plays by Oscar Wilde, which I learned by heart. Old favorites: Flaubert's Madame Bovary; Hawthorne's The Scarlet Letter; Chekhov's collected stories; Isaac Babel's collected stories; Cheever's collected stories. Newest favorite: Clark Blaise's The Meagre Tarmac. I always have more than one project roiling in my head! Right now I'm three-quarters through a collection of stories. My second project is a novel I've been thinking about for a year, mainly imagining the back-stories of its main characters. I've just started writing it.